I've teamed up with a few other blogs to bring you a nice back-to-school giveaway! 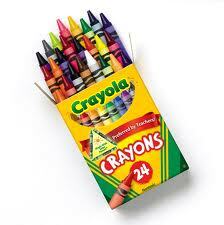 5 winners will each receive a 24ct pack of Crayola Crayons! This is a quick one, ending tonight at 12am EST. GOOD LUCK! Favorate color binder is blue. Thanks for the giveaway. My favorite coupon binder color is blue.